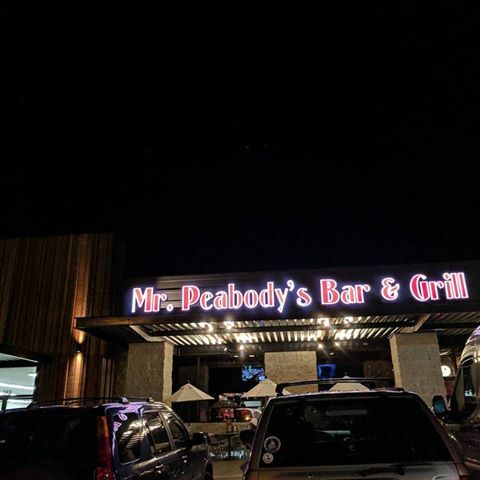 Mr. Peabody’s has been in the same Encinitas location since the early 2000s, located next to I-5 in the newly remodeled Lazy Acres shopping center, offering live music several nights per week. Thursday, April 25, 8:30 p.m.
Saturday, April 27, 4:00 p.m.
Saturday, June 15, 8:30 p.m.
Monday 3-6pm: 3-6pm: $2.75 well cocktails, house wine, domestic draft; $1.50 tacos, $.75 wings, ribs. 8pm-close: $3 well drinks..
Tuesday 3-6pm: $2.75 well cocktails, house wine, domestic draft. $1.50 tacos, $.75 wings, ribs. 8pm-close: $10 Budweiser pitchers. Wednesday 3-6pm: $2.75 well cocktails, house wine, domestic draft; $1.50 tacos, $.75 wings, ribs. Thursday 3-6pm: $2.75 well cocktails, house wine, domestic draft; $1.50 tacos, $.75 wings, ribs. 8pm-close: $4 Pacifico. Friday 3-6pm: $2.75 well cocktails, house wine, domestic draft; $1.50 tacos, $.75 wings, ribs. "To fight strippers, no one gets to dance"
May 7, 2014 @ 12:01 p.m.
Sept. 25, 2015 @ 11:54 p.m.